Just when you thought (or hoped) that the whole MMA vs. boxing thing would forever be yesterday's news - never to be talked about again - Conor McGregor (pictured) had to go and become the first fighter in UFC history to simultaneously hold two different titles. With the UFC just five days shy from making history inside NYC's famed Madison Square Garden, it's hard to ignore the giant elephant in the room who willingly left a boatload of cash on the octagon-shaped table. UFC lightweight champion Eddie Alvarez's (pictured) name might appear first on MSG's marquee, but McGregor is rightfully hoarding all of the headlines being the game's biggest draw. On Tuesday after discovering an undisclosed injury had forced Luke Rockhold out of this month's critical scrap against Ronaldo "Jacare" Souza, Gilberto Faria, Souza's manager, said they would not accept another fight unless it was against UFC middleweight champion Michael Bisping (pictured). Immediately after capturing the UFC lightweight title in July, Eddie Alvarez (pictured) requested a tango with UFC featherweight champ Conor McGregor because, after a 13-year MMA career it appeared as though the savvy 32-year-old understood that it was finally time to get paid. UFC lightweight Al Iaquinta (pictured) might be riding a four-fight winning streak, but he's most certainly going to lose his next battle. No, I'm not referring to the previously scheduled UFC 205 tango against Thiago Alves, because that scrap has been scrapped due to a contract dispute. 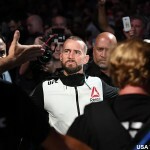 Phil "CM Punk" Brooks' (pictured) MMA debut was 19 months in the making. It took all of 134 seconds for everyone to realize the UFC isn't for him. As Kenny Rogers famously sang, "You've got to know when to hold 'em. Know when to fold 'em. Know when to walk away. And know when to run." 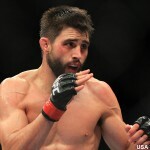 It's time for former UFC interim welterweight champion Carlos Condit (pictured) to fold 'em, walk away and run before it's too late. Controversial UFC star Nick Diaz (pictured) has proven once again that he is crazy - crazy like a fox. No mixed martial artist had a more spectacular close to 2015 than Holly Holm (pictured). On the flipside, nobody has had a rougher 2106 than the former UFC women's bantamweight champion. 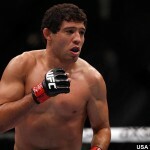 While Jon Jones and Brock Lesnar's positive drug tests at UFC 200 have left another black mark on the sport of mixed martial arts, Gilbert Melendez (pictured) is one fighter who must be privately happy that Jones and Lesnar are dominating the MMA headlines for their PED results.